Final PnP files- for real. Also, don't forget your surveys. For those of you that have completed your surveys, thank you. For those that have not, please do not forget to go in there and get that done. As of right now, we still have 300 that need to be complete. I have just re-sent invites in case they got missed. If you still do not see the invite email after checking your spam and trash folders, please let me know. Now onto the final version of the PnP. Some backers were kind enough to point out some errors on the last batch. On the last posting, there was some miscommunication with our photoshop guy and it caused some cards that had already been edited to revert to earlier unedited versions. Kirk Brownridge, Carter Bayne, and 6 more people like this update. I understand. Printing these took way too much ink as it is, so I suppose I'll just play with messed up cards for now, maybe print off little text boxes of my own to stick to the front of the cards that need changing. Hey guys, I just posted link in the newest update. Adam, I apologize but we just don't have the manpower right now to make the changes to the tokens. All I can suggest to to resize them to fit your punch and have them look a bit off or print them as given and cut them by hand. That are pirate coins so some rough wavy edges is more realistic ;-). As for the other request, there was such a colossal mess up in the files released on the 14th that it would make no sense to release a file(s) to fix it. It would just take too much to do it. I apologize for the inconvenience. the links to the 3UP versions don't seem to be working. And just doing a quick look-see through the files, there are quite a few changes, heh. Not sure if I want to go through reprinting all that, especially since its usually like one card on the whole page of nine. What are the chances of getting just a "changed card" file? Sorry for the delay. I printed the one released on the 14th. GFG-CW-Trad9UP-USLetter. Also, and I realize this probably isn't doable, but I was wondering if it'd be possible to get a version of the token sheet with stuff spread out a bit more (possibly double sided)? I have a 1-inch hole punch that would be perfect for this, but as is, they are just a smidge too close for it. Obviously not a dire need, but that would be super awesome. What version did you print? Thanks, Shane. So I already printed off the previous version and have most of them cut and put together. What's changed in this version so I know what pages to reprint? @CVP & @greyfoxgames: You are doing it good. Every good thing needs time. So take your time and you get it right. ;) Anyway the cards looks gorgeous and beautiful! Thank you all for being so patient and understanding, not to mention so detail orientated that you have found things that needed fixing! More eyes is always a good thing! Please pore over the files you do have access to and if you can find any more things that need fixing let us know! So... Not for real, and not really final? Hi Torsten. Looks like you discovered another error. These PnP's were handled in house and something go lost in clarity when they got saved. It wasn't something I noticed as when not side by side it's tough to tell. The good news is that all these cards are edited correctly (or at least as up to date as we have, I am sure we might find another mistake or two in the spelling of something). I will have a crisper one made up and get it posted here as well. Thanks. I have compared v2 with v1.2 and the v1.2 looks more crisp and the text is better to read. Top links have been pulled. They will not print properly as intended. 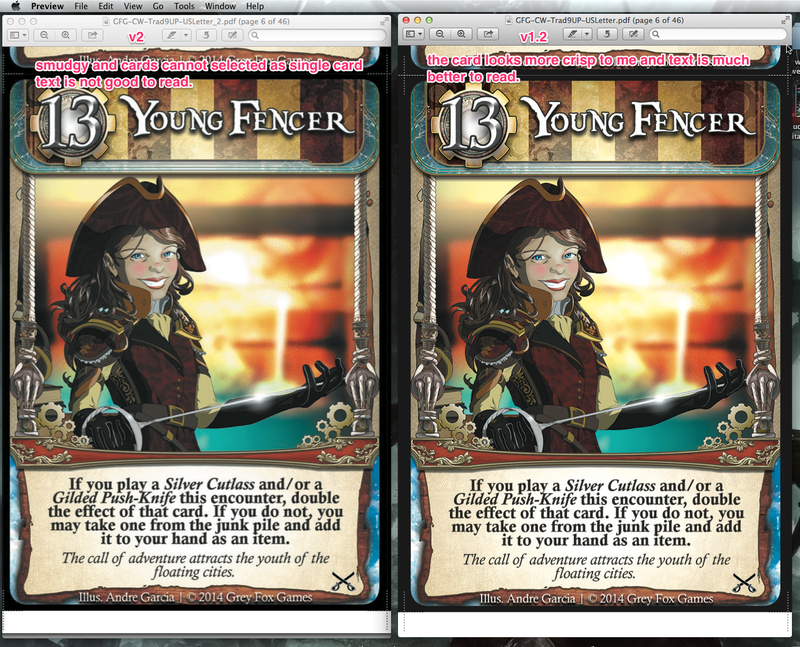 The cards themselves are all there and properly edited, but the layout isn't right. We'll post a correction here soon. WARNING: DO NOT USE THE CVP layouts linked in this update. They are not sized for the paper sizes specified in the file names. For some reason they have been cropped and centered on the page which makes using the layout... well... useless! You will end up with either 51 or 67 pages of wasted paper and ink because the files will print out centered on your page which in fact they should not be. You will notice the card backs are "larger" on the page. This is so when you cut them out, there is extra ink to cover poor cuts or folds of the page so no tell-tale signs are there for your opponent to pick up on revealing what cards you are holding in your hand. If you were to print and fold them now, they will not line as they should so it will not work. The point of that layout, is to be able to fold the paper in half to create the front & back registration so they line up PERFECTLY. These will not do that. So unfortunately you will need to stick to the Traditional 9 & 18-up layouts. Apologies.